Looking for a good home. 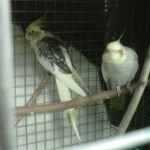 Includes cage, perches, etc. Contact GTPC info@gtpc.ca if you are interested. January 19, 2011 Meeting Cancelled due to renovations at meeting location. The CAW Hall is using the month of January to do some renovating, so we regretfully must cancel our January meeting as the hall will be closed. Our annual toy making meeting will be moved to February 16th. Thanks for your understanding.